This was a family/group effort consisting of me, my husband, my 2 year old twin boys, 3 mo old infant (1st Halloween) and dog. We are the Sons of Anarchy. A tv series based on a motorcycle gang with the Matriarch at the helm. This was a mix of store bought and DIY. The shirts and my husbands cap were all store bought costing between $17-$25 each. For my own costume the only other thing I bought was gold-colored hair spray to put in “highlights” for my character, which was on clearance, under $2. I realized at the last moment that Gemma has different color eyes than I do, thank goodness I had green contact lenses. And, for our pup, I mixed two costumes from clearance for her at $5 each. The hats my twins are wearing were hand-knitted and donated to the local Pediatric Cancer Center. One of the twins had taken ill last year and thankfully is on his way to recovery. The boys love these hats and will enjoy them as long as they fit. We are celebrating his first steps to recovery. He’s a tough little guy so I had him be the main character, Jax. 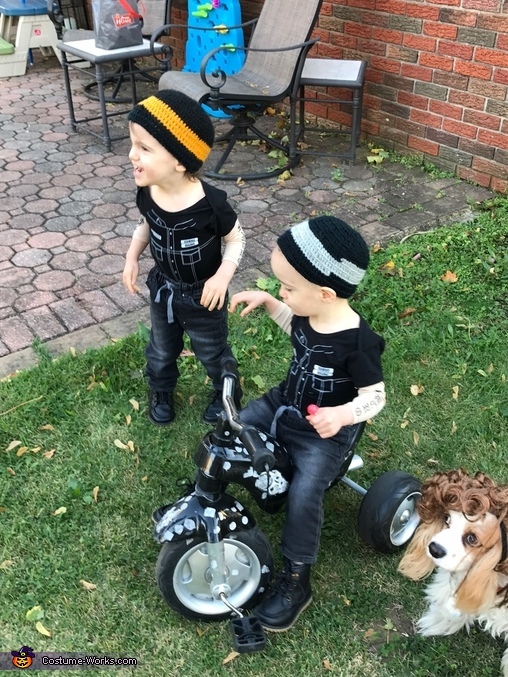 I planned this since the beginning of summer, when someone recommended the show to me, but as Halloween approached, I wasn’t sure if we should do this this year being that it’s our newest arrival’s first Halloween but when the neighbors son gave my boys his Harley Davidson trycicle, i knew it was fated. We go by many names: Mother's of Mayhem! (aka MOM), Reaper Crew, SAMCRO, and best known as The Sons of Anarchy (SOA)!